Southwold was in charge of its own law-making and enforcement for years. In the 1600s and 1700s , power in Southwold rested with twelve ‘portmen’ from whom two Bailiffs (Magistrates) were chosen, plus a common council of 24 local men. As an independent town, Southwold elected its own coroner and built its own gaol. 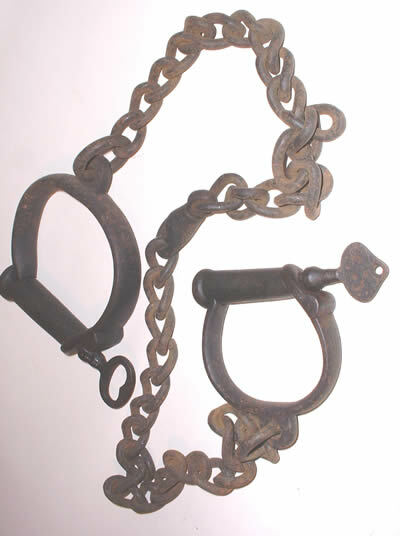 In the museum you can see several souvenirs of our local justice system, including the whipping post which used to be next to the stocks on Bartholomew Green, a selection of police truncheons surmounted by the Royal Crown (the origin of the expression 'to crown' someone), and these manacles, forerunners of today's handcuffs.